Wouldya like to go to Lodz? Ok, that play on words will only make sense if you’re pronouncing it right, and we’re willing to bet you’re not. “Wooge” is about how you say the name of this former industrial center in Poland. With its dull manufacturing history, Lodz is usually skipped over in favor of Polish cities like Krakow and Warsaw. But this hipster hub with its intriguing architecture, museums, big city parks, and rich history is now bursting with creativity. For a window into Polish food, culture, and art — without the crowds and prices of the country’s better-known cities — check out Poland’s third-largest city. Here’s every awesome thing you can do in Lodz that proves it’s the next big city for European travel. Explore Manufaktura and sleep in a former factory. 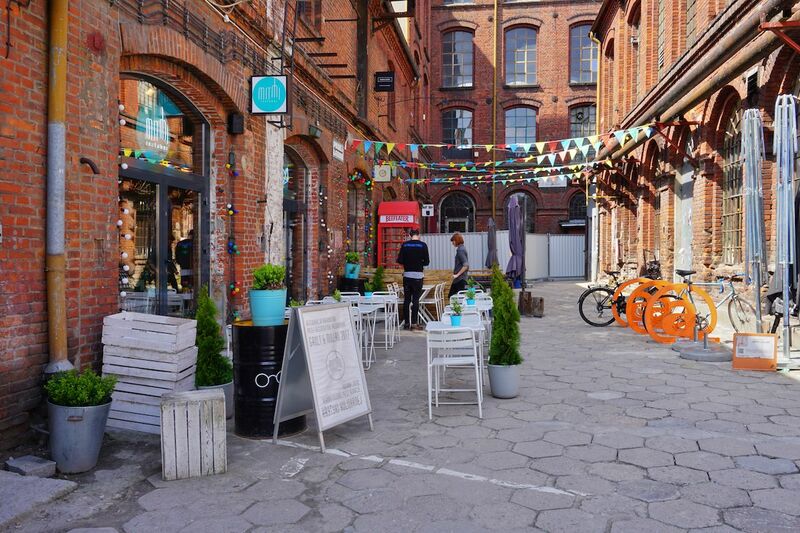 If you’ve only got a day or two in Lodz, spend your time at Manufaktura (Drewnowska 58, Łódź, Poland), a once sprawling industrial complex that’s now home to over 200 boutiques and shops, a farmer’s market, and outdoor cafes and restaurants. This former site of a massive textile manufacturing company even has a zip-line, trampolines, a bungee jump area, and an artificial beach where you can sip cocktails during summer months. If you want to experience the mesh of the city’s history and rising creative culture in one space, this is it. In fact, you can still see some of the 19th-century looms in the Museum of the Factory, one of a number of museums located within the estate dedicated to the city’s industrial past. Afterwards, view contemporary art at the nearby MS2 Museum of Art. 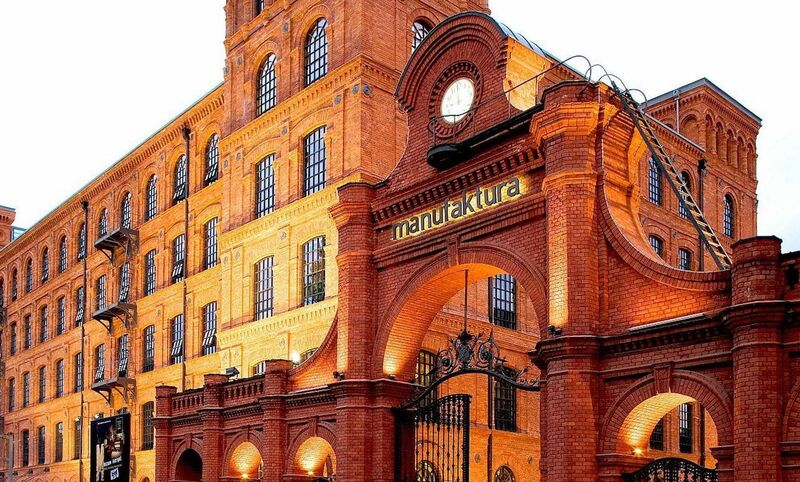 For top-notch accommodation, Manufaktura boasts one of the city’s best hotels in its converted textile mill. The modern design of the Vienna House Andel’s Lodz hotel pays homage to the structure’s industrial past by incorporating pieces of machinery from its manufacturing days. Also, hidden throughout the hotel are stencils of the many faces of people involved in the mill’s history. One of them is original textile magnate himself, Izrael Poznanski, whose estate next door houses the Museum of the City of Lodz. Head upstairs for panoramic views of the city from a quirky top-floor pool that hangs off the side off the building. Cruise one of Europe’s longest commercial pedestrian streets in a pedicab. Just a few minutes walk from Vienna House, Piotrkowska Street stretches between Independence Square (Plac Niepodległości) and Liberty Square (Plac Wolności). 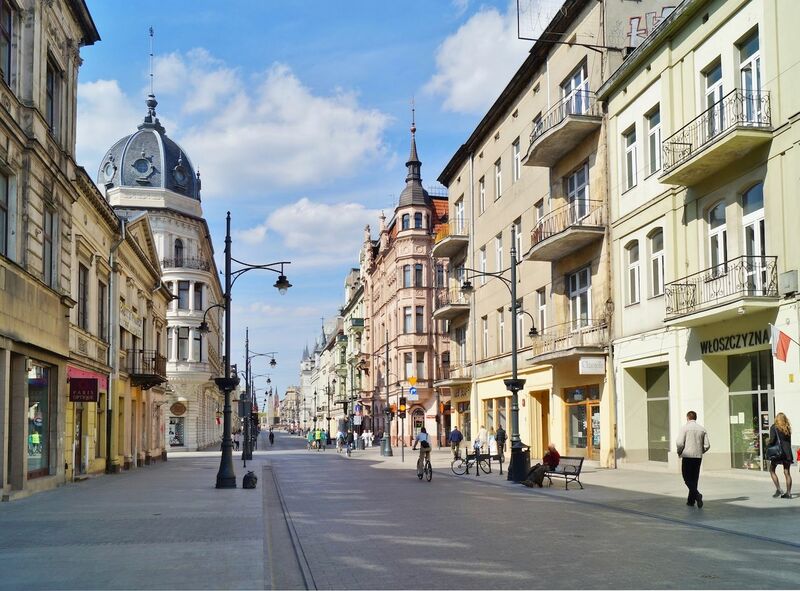 This three-mile-long promenade is one of Europe’s longest commercial thoroughfares, and it’s the home of Lodz nightlife. Here you can walk “Holly-Lodz” — it works better with “Wooge” — Poland’s very own Hollywood Walk of Fame, where stars bear the names of the nation’s most prominent men and women in film. If you don’t want to hoof it along the entire street, catch a pedicab. As you cruise in your inexpensive cycle-rickshaw, check out the colorful street art covering the walls of brick buildings that line the route. You can also scope out your next stop to eat, choosing from the city’s best cafes, bars, and restaurants that grace Piotrkowska Street. 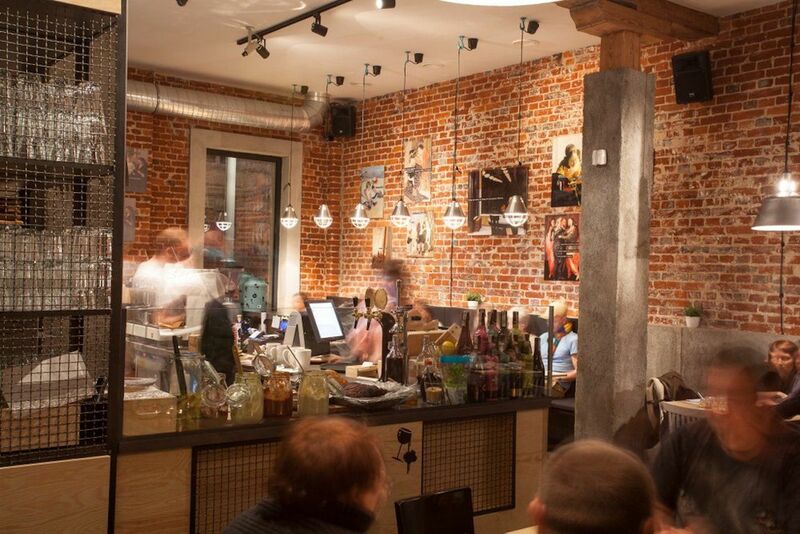 Hop off and head to a favorite hotspot amongst expats and locals alike, Lodz Kaliska. This labyrinth-style club amuses visitors with three floors of nonsensical chaos. Exposed pipes, glass floors, and one-way potty mirrors share space with art portraying Victorian-era breasts while whacky DJs bump beats into the early morning. Embrace the madness. You’ll get a sense of the city’s creativity as you stroll Piotrkowska. But duck into a cobbled alleyway for a drink at one of the many yards tucked off the main avenue to witness its real inventive genius. Number 217 hosts the street food festival and food market, and it has a handful of cafes and restaurants serving delicious and affordable fare. In Number 3 (Rosa’s Passage), you’ll be blown away by buildings covered with mirror shards that reflect the sunlight, the work of award-winning artist Joanna Rajkowska. The resplendent mirrors brighten up a city determined to reinvent itself as more than a dreary former industrial hub. The most popular yard is Off Piotrkowska — aptly named as it’s, well, off Piotrkowska Street. Here at Piotrkowska 138/140, on the grounds of a former cotton mill, over 50 businesses operate — from vintage boutiques to restaurants and galleries. This was one of the original modern efforts to transform old industrial structures into contemporary creative hubs. The inventiveness is palpable at places like MITMI Restobar or the Brick Coffee Factory. Come for some quality people-watching or pen your next novel. Grab some tasty Polish grub. Lodz’s restaurants serve up delicious, hearty cuisine at more affordable prices than in Krakow or Warsaw. If you remember nothing else about Polish food, recall the five Ps: pickles, preserves, potatoes, pierogi, and pampuchy. Traditional Polish dishes include pickled and smoked meats, vegetables, sauerkraut, and potatoes. You can have these ingredients packed into pierogi (think Polish ravioli) or served alongside pampuchy (steamed buns) for the ultimate “stick-to-the-ribs” feast. For dessert, Poles see no need to reinvent the wheel. Stuff the pierogies with plums and preserves to switch from savory to sweet and you’ve got yourself a delicious after-dinner course. 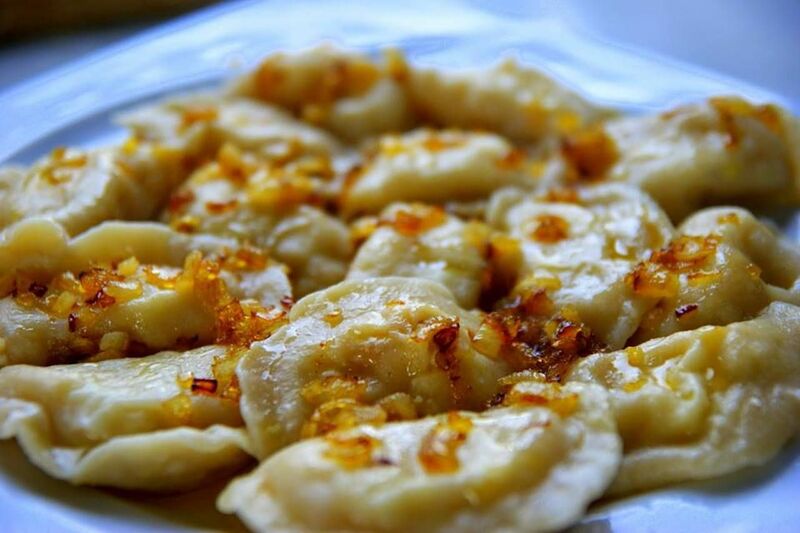 To eat like a local, stop by Koperek Bistro at Off Piotrkowska for inexpensive homemade dishes prepared daily, or gorge yourself with meals like your babcia used to make from the rich menu at Chlopska Izba. No description of Polish dining should fail to mention vodka. In Lodz, though, it’s not just any vodka. Żubrówka Bison Grass Vodka is rye vodka flavored with grass grown in the Białowieża Forest, one of the largest swaths of the primeval forest that once stretched across most of mainland Europe. A herd of around 800 European bison, Europe’s heaviest land animal, graze on its grass. Down a shot and eat the blade of bison grass sticking out of your bottle to obtain the bison’s strength. If the locals look at you funny, just blame us — the grass is mostly decorative. 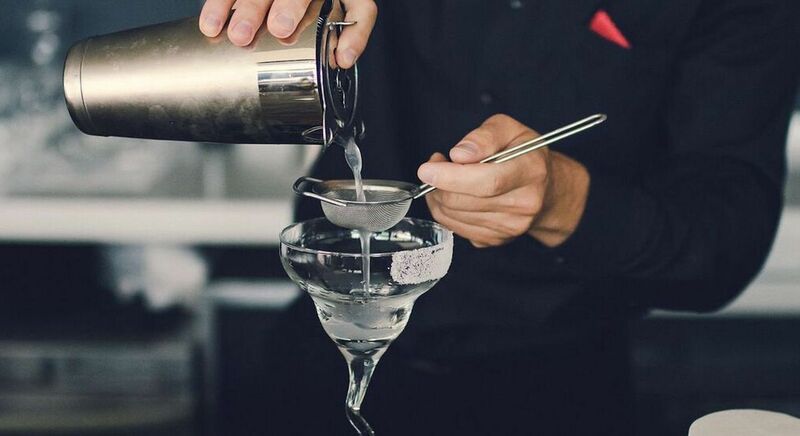 Good news if you took our advice and chose to stay at Vienna House Andel’s Lodz: Its skyFLY rooftop bar offers baller bison grass vodka cocktails garnished with that sweet, Instagram-worthy view we mentioned. 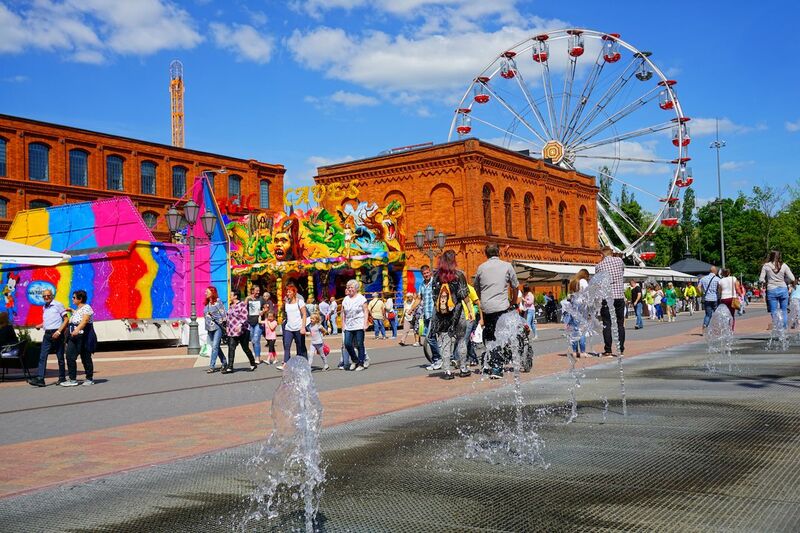 After you’ve eaten your body weight in pierogies and a headache has settled in behind your eyes, walk off all the partying and feasting in one of Lodz’s many parks. Pick from around 40 urban parks, green spaces, and gardens located around the city. Park na Zdrowiu (basically “Park on Health”) has beautiful botanical gardens, as well as beer stalls and street food for those warriors forging ahead with the debauchery. Mickiewicza Park, north of the city center, has a large lake, an amphitheater for summer plays and concerts, and beautiful blossoms in springtime. 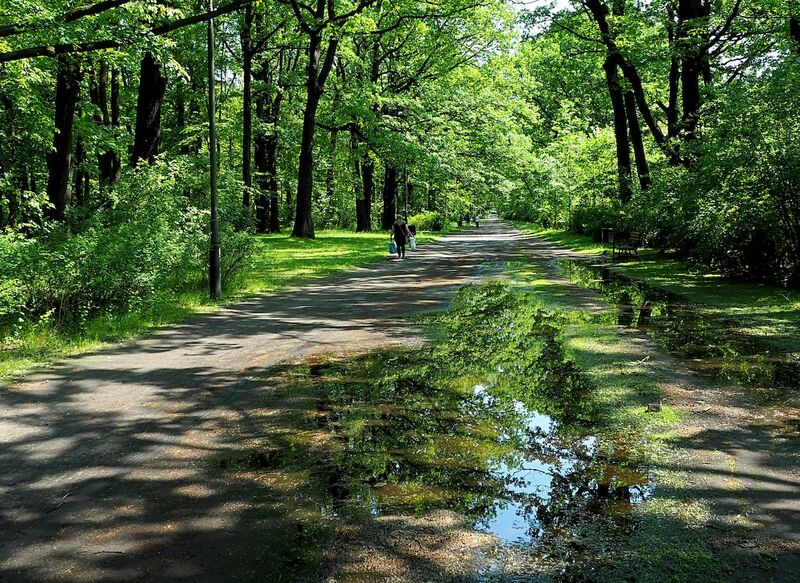 Finally, walk the pretty paths meandering beneath 19th-century trees in Park Źródliska. Officials dedicated the space as a meeting ground for cotton mill workers and constructed The Palm House, which now hosts a range of funky plants, including those of the carnivorous variety. Efforts to revitalize and reinvent Lodz doesn’t mean residents have lost sight of their city’s darker moments in history. Despite the moss and undergrowth covering much of the city’s Jewish Cemetery, you can still make out names and Hebrew sayings and symbols on worn stones that mark the 180,000-plus people buried here. 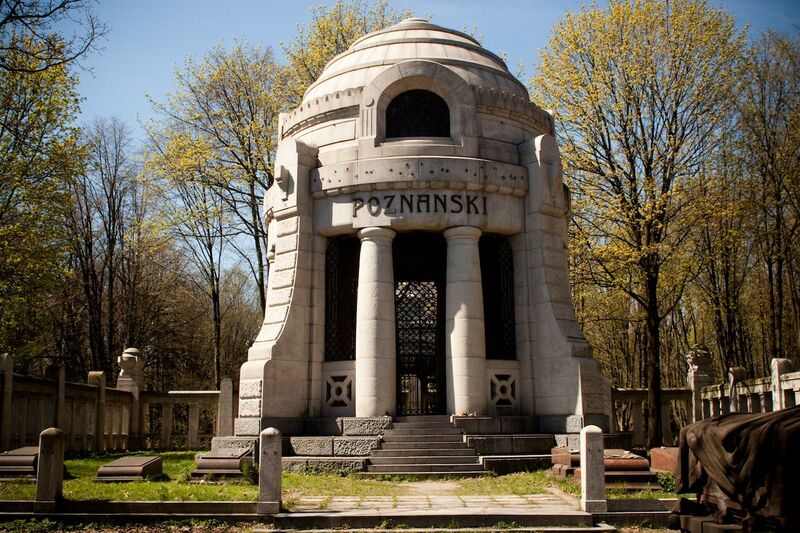 Most notable is the ornately decorated mausoleum of Izrael Poznański, the textile magnate and owner of what is now Manufaktura. Bodies of around 43,000 victims of the Holocaust from the nearby ‘Litzmannstadt’ ghetto lie within the reserved Ghetto Field section of the cemetery, serving as a somber but necessary reminder of an event that must never repeat itself. Get educated at one of the many museums. 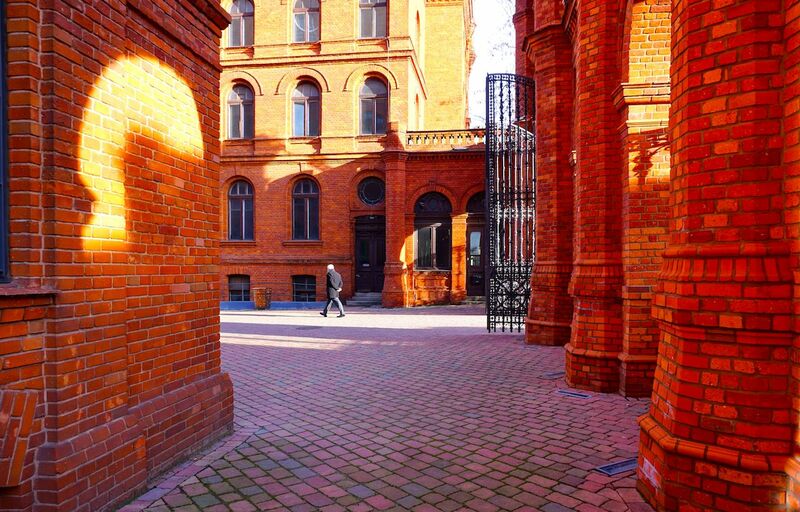 We’ve touched on many of the museums you can visit to get a glimpse into Lodz’s industrial past. Remember that when you explore Manufaktura, you’ll see the MS2 Contemporary Art Museum. You’ll also want to check out the original Museum of Modern Art, one of the oldest modern art museums in the world. It’s collection showcases genres from 20th- and 21st-century Poland, like cubism, purism, constructivism, and neoplasticism. 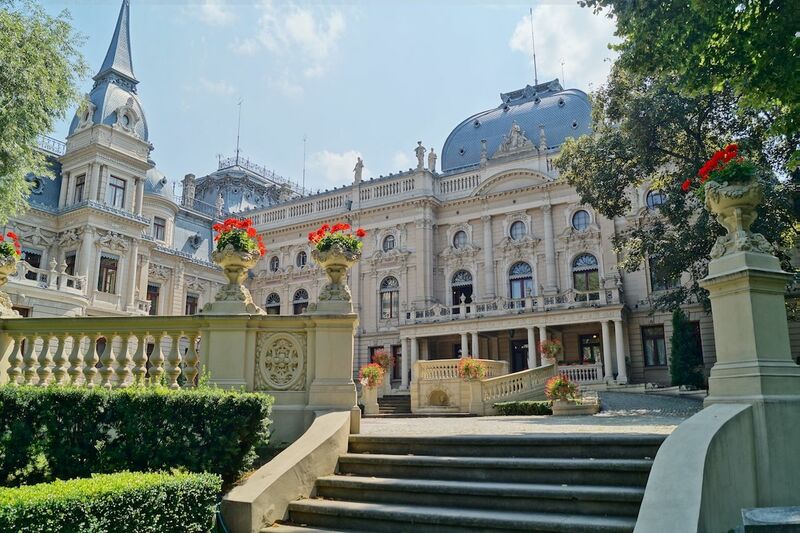 Then, check out a third location of Lodz’s Museum of Art at the Herbst Palace and Museum, which belonged to two of the city’s most prominent industrial families, the Scheiblers and the Herbsts. The Old Masters Gallery here has works from famous European artists from the 15th to 18th centuries. Admire the range of architecture. Beyond the abandoned mills and transformed factories, it’s not all brick and steel in Lodz. Take the Grand Theater, for example. From the outside, it looks like what you’d expect from a communist-era structure: a bunch of cubes, rectangles, and right angles stacked on top of one another. But inside, a comfortable, modern interior boasts astounding acoustics capable of doing justice to the orchestras, choirs, and opera singers who perform there. In contrast, the colorful Alexander Nevsky Cathedral stands out as a tribute to Russian Emperor Alexander II’s escape from an assassination attempt in the late 1800s, and its unexpected presence makes it worth a visit. 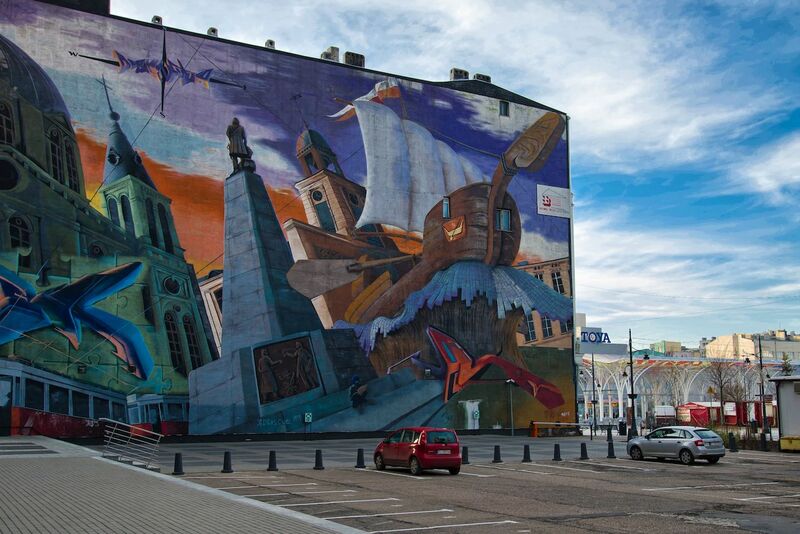 As you admire Lodz’s architecture, you’ll notice countless colorful and innovative murals. Many are the result of the city’s Urban Forms Foundation, which kicked off in 2009 to bring the post-industrial cityscape to life. Lodz has welcomed renowned artists from around the world to join local talent to rejuvenate the otherwise dull, beige exteriors of many of its structures. Thanks to the effective initiative, giant weasels now play on walls on Ogrodowa Street and a blue elephant flies on Uniwersytecka Street. See what else you can spot while you explore. Lodz draws the power to reshape its future not just from the vibrant street art that covers its buildings but also from the buildings themselves. Old textile mills — with their vaulted ceilings, tall windows, and rustic interiors — serve as spacious sandboxes for modern designers to play in. Structures once built for looms to weave clothing now beckon creative individuals, urging them to weave together new styles with old industrial elements to create bold, modern spaces for the 21st century. Lodz’s most captivating results come from those artists and designers who embrace these remnants of an inescapable industrial past, incorporating them into their craft. 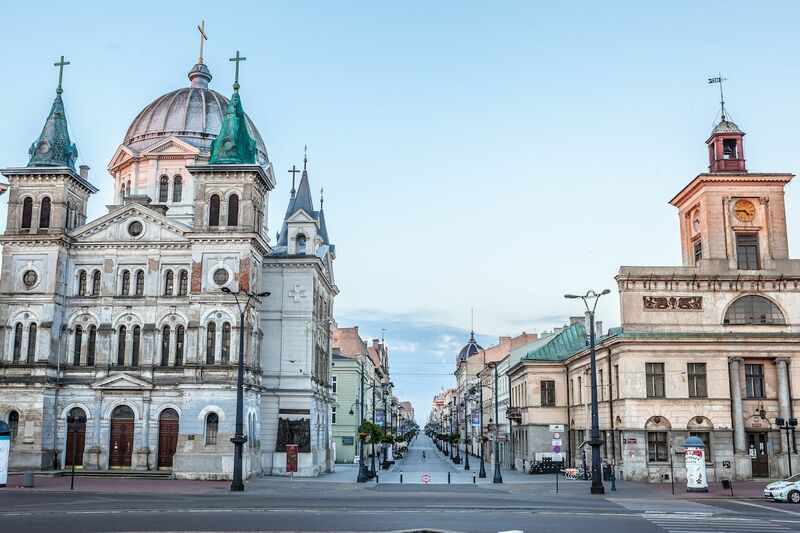 Spend some time exploring the rising city of Lodz, and you’ll embrace them, too.